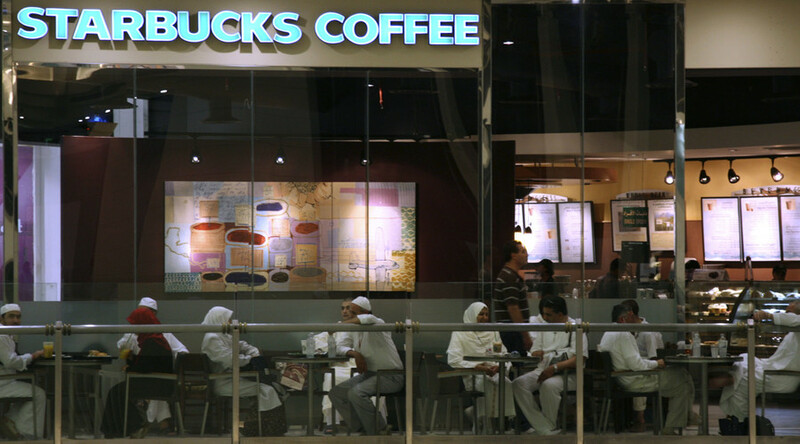 Women in Riyadh have been banned from local Starbucks after a barrier designed to keep the genders apart collapsed. The company suggested female customers send their drivers to pick up drinks. The Commission for the Promotion of Virtue and Prevention of Vice or religious police ordered Starbucks to ban women after an inspection found the wall had collapsed. After the posts on Twitter, Starbucks came up with a statement. "Starbucks in Saudi Arabia adheres to the local customs by providing separate entrances for families as well as single people. We are working as quickly as possible as we refurbish our Jabir store, so that we may again welcome all customers in accordance with local customs," the company statement read. Female segregation is enshrined in Saudi Arabian law. Women are required the approval of a male to leave the house. Last December, women in Saudi Arabia were given the right to vote in local elections, but they are still forbidden to drive.